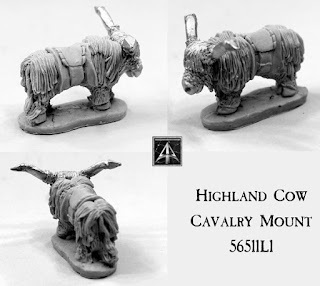 There were rumours about a while back that Alternative Armies would be continuing the re-mastering of the existing mounts range for Flintloque and also perhaps expanding the Joccian Army as well. It was true! Last week the new 56520 Joccian Light Infantry made its debut and now we have not only replaced the white metal riding Highland Cow with a resin version with a price reduction but we also have a new limber Highland Cow which is with the artillery crew and divisional box too. Go HERE for the Army of Greate Britorcn or read on for all the codes which have been updated. This is our last Valon release and news for the month of May 2018. 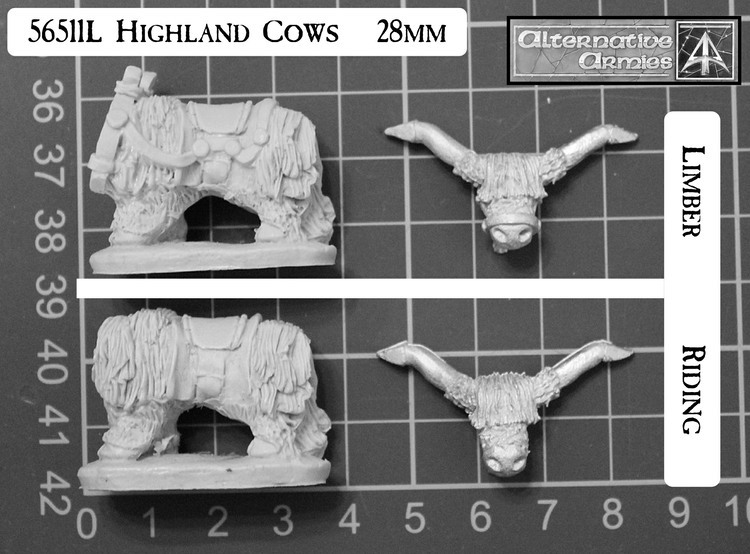 The new resin Highland Cows are identical to the white metal ones except in a change to a high quality grey tone resin for the body (the separate head remains in white metal) so your riders will continue to be ideally suited to their bovine charges. 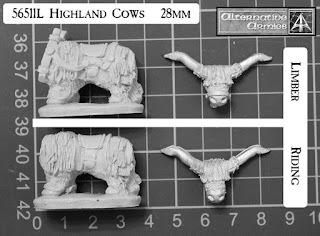 Here are pictures of the Highlands Cows showing their parts and sizes. 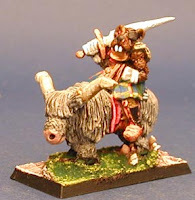 The riding cow has a saddle and works with most 28mm riders who fit wider horses. The new limber cow is fitted with tackle and also has a yoke and also a saddle if you wish to place a rider upon it. 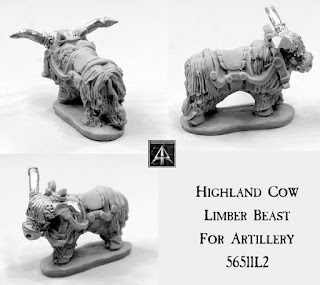 You can purchase these creatures in the new 56511L Riding and Limber Cows code selecting either cow in any quantity on the page to add to your forces. There are five codes altered with this news. 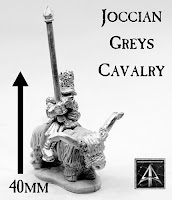 The famous North Britorcn Cavalry the Joccian Greys. Mounted on shaggy haired Highland Cattle they are a veteran regiment and have served many campaigns all across Valon. They are light cavalry armed with swords. Choose from a single trooper, pack of five or a unit of ten each with a saving. There is an officer, standard bearer and a trooper pose. The riders and cow heads are white metal and the cow bodies are resin. Go HERE. 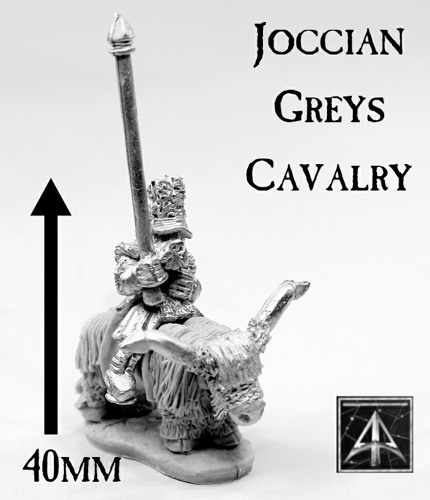 The Joccian Command Set gives you four officers on foot and two mounted for all purposes. Use in all Joccian sections and units. Officers are Aggressive, Officer Cowardly, Officer Dastardly and Officer Heroic. The Mounted Colonel is on a Ram and Mounted General on resin Cow. Go HERE. 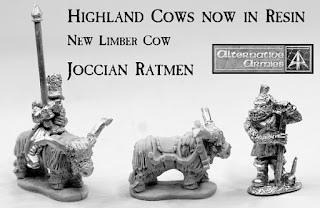 The commander of all the Ratmen in Catalucia and right hand of the Lord Wheeling-Turn all the regiments of Joccia are inspired by the sight of Archrat Gordon. Now mounted on a resin cow. Limited to one thousand numbered packs only. Go HERE. The foundries of Joccia make almost all the cannons used by the Army of Albion so troops have a lot of time to practice at home. They are fine gunners. These Six Big Ratmen are classed as Gun Crew. 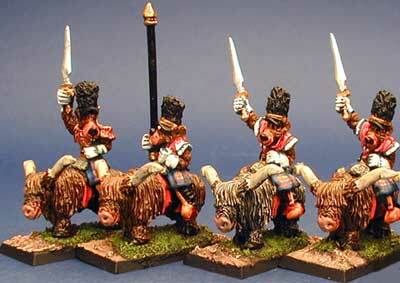 An Officer and Five Gunners as well as two of the new resin Limber Cows. Add them to your collection. Go HERE. 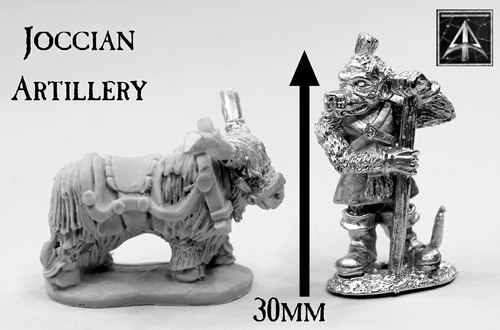 This week until Sunday 20th May midnight GMT there is 10% off every miniatures, pack and unit in the whole Goblin Army of Al-Garvey collection for Flintloque and Slaughterloo. Choose from personalities, lizard cavalry, dodo cavalry, light and line infantry as well as artillery and gun crew plus detonation dodos! Click through to see all the codes and the Goblins can be found in 5025 War in Catalucia and 5030 Slaughterloo. Ten percent off all the miniatures and units in Alternative Armies 28mm historical range of Jacobites until midnight GMT Sunday 20th May. The Prince, the Piper, Bonnie Flora and many others plus Dancers. Great in any suitable game system. Click through to see them all. 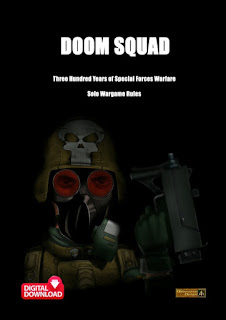 Thanks for reading and we will be back with a free article from Andy Jefcoate as well as further new releases for Bits and Sprues and Grinning Skull before the end of the month. Additionally our website and email clients are now GDPR compliant as per the implementation date of 25th May 2018. Alternative Armies is happy to assist with any questions on sales@alternative-armies.com and you must now set up an account to place an order and additional confirm to join our mailing list. See our Information page for more.